Why the PVC pressure pipes are so popular in Residential Water Supply System? - Taizhou Zhuoxin Plastics Co., Ltd.
You are here: Home » News » Industry News » Why the PVC pressure pipes are so popular in Residential Water Supply System? What is the PVC pipe connector dimensions? What is the PVC pipe? Which one is better PVC pipes or PPR water pipes? Why the PVC pressure pipes are so popular in Residential Water Supply System? As we know, the PVC pressure pipe is the most widely used in residential water transport media in the world, and you must want to know why the PVC pressure pipes are so popular. 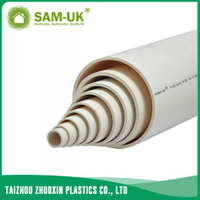 Here we introduce to you the reason with the importance of PVC pressure pipe. PVC pressure pipe is currently the most widely used in residential water transport media in the world. 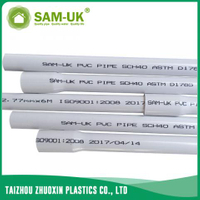 Household PVC pipe applications are divided into two categories, mainly determined by the use of places, divided into pressure system(PVC pressure pipe) and no pressure system. Due to the characteristics of PVC raw materials with anti-acid and alkali, light weight, compression capacity, low prices (relative to traditional materials), easy installation and other characteristics, the PVC pressure pipes was accepted. In the last few hundred years, people have been using steel, ductile iron and other material pipe, due to the defects of these materials to PVC material-based pipeline only 80 years to occupy most of the home water supply market.